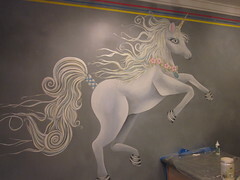 Meghan Keneally A mural at the forthcoming shop. Last time the Big Gay Ice Cream Truck updated its blog, the East Seventh Street store was due to open in mid-August. Well, it’s mid-August, and there is still no sign of the Choinkwich. What gives? Yesterday, owner Doug Quint explained in a blog post that final electrical upgrades were set to start this week, and “could take up to two weeks- but hopefully less.” In the meantime, he has a request: “Please, I do ask you refrain from tweets and Facebook posts asking when we’re going to open. After two months and thousands of such messages, it’s really just becoming overwhelming.” So relax already, and maybe head up to the Cape this Friday to catch the truck’s pop-up event there.